Marc Kinchen, better known as “MK” began his solo career in 1989. Kinchen has reached varying levels of success in his 24 year career, from his #1 hits “Always” &“Love Changes” back in ’93/4 to his current remixes for Storm Queen, Huxley & Hot Natured. In the early 90′s underground club scene MK – Burning became a house anthem (and still is today), however it’s his previous alias’ with Terrence Parker & Chez Damier that go relatively unnoticed. 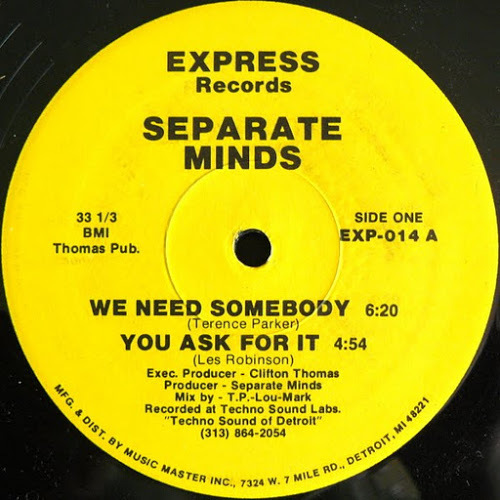 Separate Minds consisted of Lou “Trackmaster” Robinson, Marc Kinchen, Terrence Parker, Vernell Shelton (of Scan 7, along with Robinson, it was a Detroit group closely connected to Underground Resistance). Formed in 1988 the group released two EP’s, We Need Somebody in ’88 & Troubled World in ’93. In ’89 Kinchen was also collaborating with house legends, Chez Damier & Kevin Saunderson, under the alias Power 41. Though they never released a track (and the project only lasted less than a year) Power 41 produced & remixed the likes of Inner City, Reese & One on One.